New York Mayor Michael Bloomberg tellingly misinterpreted a reporter's question during a pre-Sandy press conference Sunday. When asked about what would happen on Rikers Island -- New York's main prison complex -- during the storm, Bloomberg responded, "Jails are secure ... Don't worry about anyone getting out." He did not consider that the journalist was in fact asking about the well-being of the near 17,000-strong inmate population, incarcerated on water-locked landfill. Last summer, when Hurricane Irene threatened the city, the discovery that there was no evacuation plan in place for Rikers evoked outrage from civil rights and prisoner advocates. 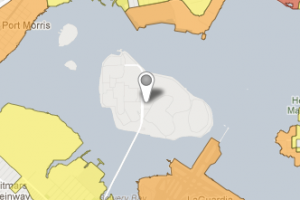 All of New York's other surrounding small islands were listed as possible evacuation zones ahead of Irene (which brought the city none of the damage promised by Sandy), but Rikers was not listed in evacuation plans at all.